Incredible place, so warm and friendly. The atmosphere is exactly what everyone wants in a hostel and I made some fantastic friends. The family dinners are a must and all the facilities are perfect. I booked all my tours through them and the staff are incredibly accomodating. If I came back to Dalat I would definitely come here again and I recommend this hostel to everyone I meet. Fantastic homestay - the family & staff go above and beyong to make you feel welcome and make sure you have everything you need. The beds are super comfy, the showers are the best I've come across in Vietnam and the common area is cosy and welcoming. I am a solo traveller and it was super easy to make friends during the family dinner or during day trips organised by the hostel. 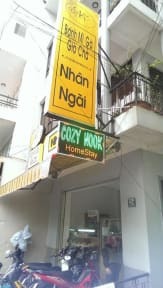 Highly recommend cosy nook for your stay in Da Lat. This is literally Heaven! Best Hostel! It was just like staying with your own family. The owners and staff were incredibly friendly and made us feel welcome from the very start. You couldn't wish for better hosts! Family dinners were exceptional, don't miss out on it ;) The Beds are comfy, the wifi fast, the guests multicultural and super fun, and everything is just perfect! Life's good at cozy nook! Best hostel of my trip in vietnam !!! We were really curious while reading the reviews on what could make this place so incredible, now we understand better. We had an amazing stay at Cozy Nook. The animations and the family dinner is great and you will feel at home very easily. This is definitely one of the best hostel I have stayed in all Asia. Personnel très accueillant et aidant avec une bonne maitrise de l'anglais. Les "family meal" du soir sont une bonne occasion d'échanger entre voyageurs mais ils sont servis à 18h, ce qui fait tôt!